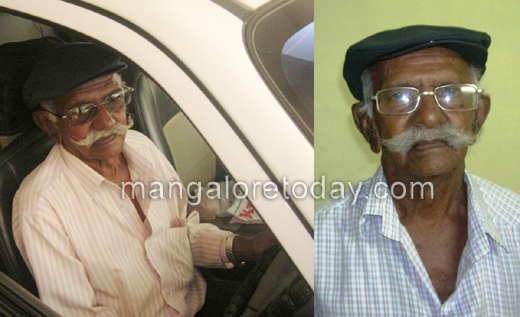 Mangalore, Oct 13, 2014: Michel D’souza a retired defense personnel residing in Mangalore is all set to that century in life very soon. Admiring citizens of the city have planned to felicitate and celebrate Michel D’souza. He a retired driver with the Indian Army and the Public Works Department, drives around in his vehicle and possesses a driving licence valid up to 2019. He easily climbs up four flights of stairs and never takes the lift, he told the Centenary Celebration Committee, andt still is not depending upon anyone for his daily routine.Living on Microwave Station Road, Hat Hill, and leads a solitary life maintaining his own garden, dog, and ducks. Mangalore Today’s frequent writer and rationalist, Narendra Nayak, a long time well wisher of centenarian D’Souza said, “I know him for more tahn 40 years. We used to walk together. He used to approach me when he needed information on matters. I did never knew he was almost a hundred years old. Last year, when I enquired his age I was astonished to know the fact. I assured him that his century will be celebrated and we friends have decided to do so. He is always active and even climbs multi-storied buildings without using the elevator". He lost his wife a few years ago and has no children. He still goes about getting necessities and groceries and cooks his food; washes his clothes and maintains his house all by himself. He has been a great source of inspiration to many, particularly people in his locality, said M. Seetaram and Narendra Nayak committee members. Neighbours and friends have decided to celebrate Micheal D’Souza turning 100 on October 16 and have will hold a function at the auditorium of Canara College here at 5 p.m.